Many people find it hard to believe that cat discipline is possible but despite their independent nature it is possible to train a cat that a particular behaviour is bad. All it takes is some patience and consistency in their training. So give it a try and don't give up. It is important to remember that cats are not people they work using their own logic and instincts. 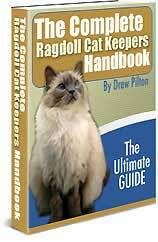 Your Ragdoll probably sees you as another large cat and will respond to you accordingly. For times when you are near your cat when behaving badly 'The Face Push' technique should be used. It consists of a GENTLE but firm push back on your cat's face along with a stern 'NO' command. This is a strong message to cats and used consistently will re-enforce the message that a particular behaviour is wrong. When your Ragdoll cat is further away and needs reprimanding a water pistol filled with water and a dash of vinegar as a great tool. Just a quick squirt in the face with a stern 'NO' command is enough to stop them in their tracks. Where the above methods are impractical a small plastic bottle partly filled with pebbles or coins when shaken or dropped along with the 'NO' command can provide a great deterrent from bad behaviour. Avoid over use of this method to prevent your Ragdoll cat from becoming desensitised to its affect. Using the above techniques consistently will soon teach your Ragdoll cat which behaviour is correct and which is unacceptable. Play aggression is the most common form of cat aggression and is usually your cat playing rough. This is almost always because they have been taught to play like this from when they were kittens; this is called 'conditioned aggression'. As explained above if you have this problem then it was conditioned into your Ragdoll cat from when it was a kitten. To prevent doing this when rearing kittens always divert aggressive play onto toys and other objects like string on the end of a stick. This will help to distance the aggression from you. If necessary use a squirt gun to stop the wrong behaviour along with the usual 'NO' command. When an aggression problem develops suddenly for no apparent reason, it could be caused by pain. Your cat has no way of telling you if it has a medical condition and is in pain so biting or scratching you could be your cats way of either getting your attention or protecting itself. If it persists you should consult your veterinary surgeon to discover if there is a medical problem, which needs treatment. This is a common problem with cats if they are not taught otherwise. A squirt in the face with the squirt gun or a drop of the rattle bottle along with the 'NO' command may be all that is required to deter your cat from jumping up but you must be consistent so that your Ragdoll cat knows why they are being squirted. Stop Them Shredding Toilet Paper. If your Ragdoll cat attacks your toilet paper simply ensure the roll is turned so the paper comes down between the wall and the holder and place a small plastic cup with a little water in it on top of the roll. When your cat grabs the paper they get a cup of water on their head. For less mess you could use a rattle bottle instead.